Established in 2002, at Noida (Uttar Pradesh, India), we, “Mac Well Machinery”, are occupied in manufacturing and supplying high quality range of Liquid Packaging Machine, Sealing Packaging Machine, Food Processing Machine and Granules Machine. The offered products are manufactured using high quality components and cutting-edge technology in compliance with the international quality standards under the supervision of our quality controllers. The components that we use to manufacture these machines are procured from the certified vendors of the market. Our products are highly demanded in the market for their features like durability, strong construction, excellent efficiency, corrosion resistant, reliable performance, long service life and trouble free operations. Apart from this, we also offer our products in various specifications as per the requirements of our clients. We have established an ultra-modern infrastructure unit that is spread across a wide area. We have built a vast infrastructure that is segregated into different units for carrying out various business operations. This infrastructure unit is divided into various departments such as production, quality testing, R&D, sales and marketing, etc. All these units are handled by our highly skilled professionals who have rich industry experience and knowledge. Our manufacturing unit is armed with advanced tools and technology that are coupled for production of impeccable quality products at a rapid production rate. Owing to the quality and numerous other features of our products, we have been able to attain the highest level of client satisfaction. By working in close association, our experts enable us to fulfill the ever-changing requirements of clients in predetermined time frame. Also, we organize important training sessions for our team members in order to enhance their skill and knowledge. Our organization has successfully expanded its business in market owing to the offered elevated quality array of machines. The offered machines are manufactured using quality approved components and latest machinery in order to meet the international standard. In order to make our products in line with international quality standards, we have developed a quality control facility that is manned by our skilled quality personnel. Our skilled quality inspectors test the products on well-defined parameters of quality using modern testing tools and devices to ensure impeccable quality of products. We maintain a level of transparency in all our business dealings that allow us to be trusted organization in this domain. Our products are delivered in a high-quality packaging material in order to ensure safe transit at clients end. Owing to our ethical business policy, transparent dealings and a wide distribution network, we are able to expand our client base all across the nation. Under the leadership of our Proprietor, “Mr. Hemraj Sharma”, we have achieved a reputed position in the industry. His constant levels of focus and promise have enabled us to serve to gain such a huge client base all across the country. 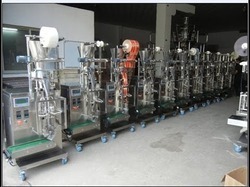 Manufacturing and Trading of Liquid Packaging Machine, Sealing Packaging Machine, Food Processing Machine and Granules Machine. Mr. Hemraj Sharma is the Owner of the Company. He holds a graduate degree in engineering from Lucknow University, India. He joined technical team in 2002 and is in charge of Entire technical, manufacturing, laisioning and extension services. He is responsible for establishing a company’s technical, vision and leading all aspects of technology development, according to its strategic direction and growth objectives. Backed by an advanced and sound infrastructural facility. We are able to provide our clients with a comprehensive assortment of machines. In order to maintain smooth work flow, our infrastructure is divided into different departments such as manufacturing, quality control, R&D, warehousing & packaging, etc. The production unit is equipped with advance machinery and technology that assist us in meeting the bulk and urgent orders of clients within the promised time frame. All these units are operated by our professionals who possess enormous industry experience.